here’s my me-made-may 2014 roundup! my countless selfies (32 because i had two outfits on one day…) were documented on instagram, and i took the lazy approach of reflection in my bedroom mirror… it doesn’t get any classier than that, folks. what did i learn? clearly i have a thing for grainline studio patterns… worn on 15 days (often two at a time), with only a few items repeated. oh, and i desperately need a haircut. the holy grail of sewing (other than a couture wedding gown) would have to be jeans. jeans have been on my to-sew list for a long time, but frankly i was slightly afraid of failure so they kept getting pushed to the side. 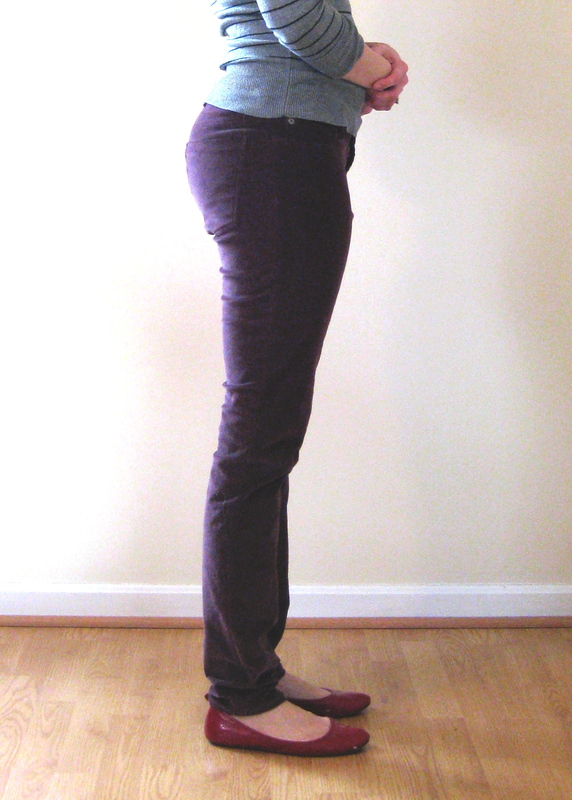 recently i picked up some $2/yd stretch corduroy on a crazy sale and decided to finally give jeans a try. i went with the ever-loved jalie 2908. i’ve made this pattern for my daughter twice and had great results, so i got to tracing off my own size. right now i’m about 75% happy, so i thought i would talk fitting. i’m not a pants-fitting expert, so what i say here is simply my own personal experience, and stuff i’ve picked up from fitting books. feel free to chime in if i say something that sounds totally off! 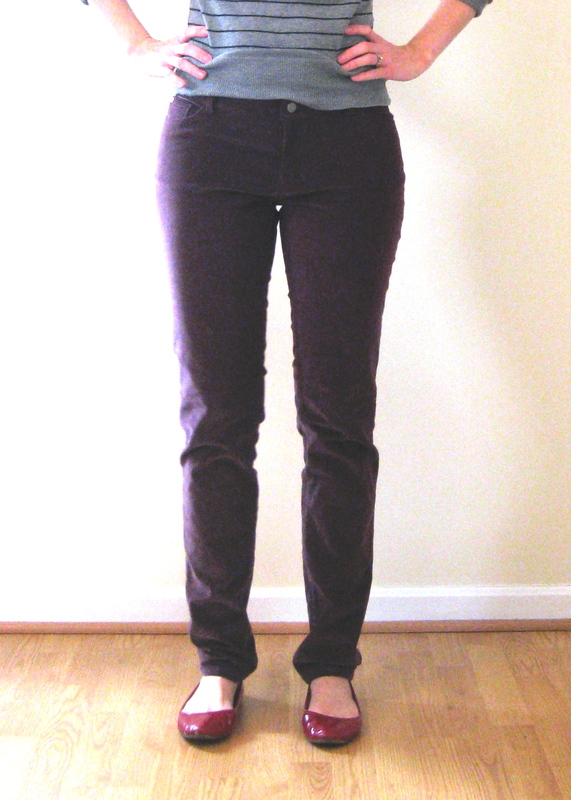 to begin, i wanted skinny jeans (i know… i’m using corduroy, not denim, but we’re just calling them jeans since they have the same stretch and design details) so i took some measurements from my everyday jeans to give me a starting point. 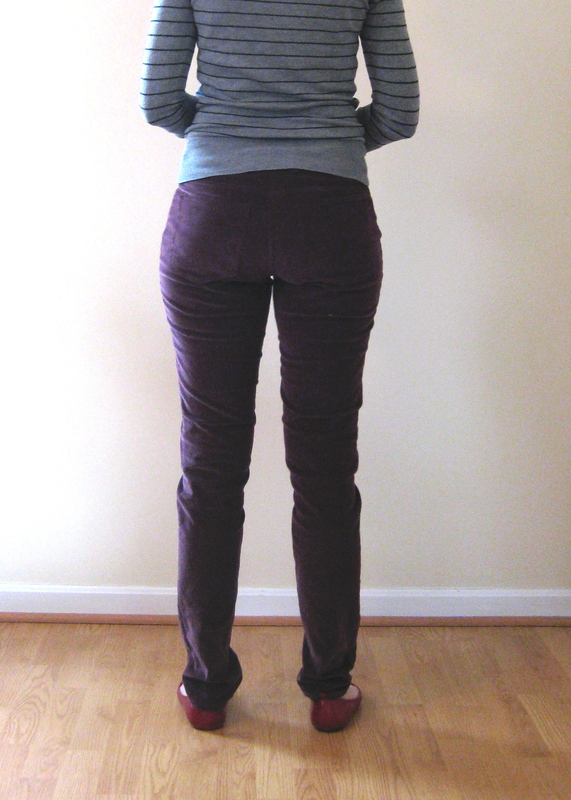 the pattern is already fit with negative ease through the thigh, so most of the tapering came from the knee down. i did have to bring the back outside seam in a little right before the knee, but from there i tapered in symmetrically. i also added 1 1/2″ to the length. the leg shape i’m happy with, though i may try to reduce the under-bum wrinkling. now for some crotch talk! ugh, can we as the creative type come up with a better term than crotch??? for realz people. this needs to happen. anyways… off the bat i added a wedge to increase the back rise by 3/4″ (i’ve seen this called a “full bottom adjustment” hahaha the only FBA i’ll ever need!). this worked well, and the overall crotch seam length i’m happy with. so what’s this 25% i’m not happy with? i have this wedge of fabric just kinda hanging out below the fly. it doesn’t really show up in pics the way it does when i’m looking in the mirror, but this is something that definitely does not occur in my RTW jeans. i think i have two issues here: one—the pants aren’t sitting close enough in the front, and two—i have a “prominent thigh” pulling the fabric out, which is more obvious in profile. i think if i adjust the front crotch curve to be flatter, most of my issues will be solved. reducing the front curve will inadvertently add width to the front of the leg, making room for my prominent front thigh. 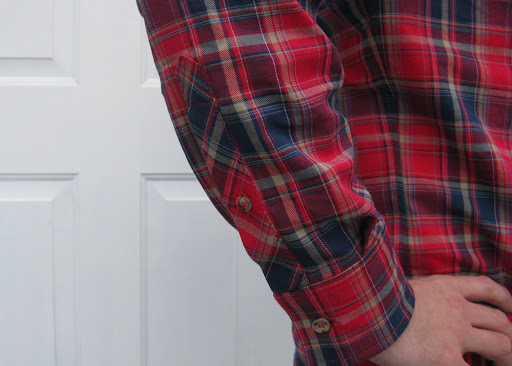 the waistband on this pattern is the straight cut, fold over type. it is cut on the bias and interfaced with stretch fusible. i didn’t feel like messing with a new curved waistband, but i will on my next attempt. by the time i got to the waistband i knew these were in “wearable muslin” territory so i didn’t sweat it. for round two, i plan to baste on a straight piece of muslin, then take darts in around until it sits flat, and use that to draft a custom waistband. 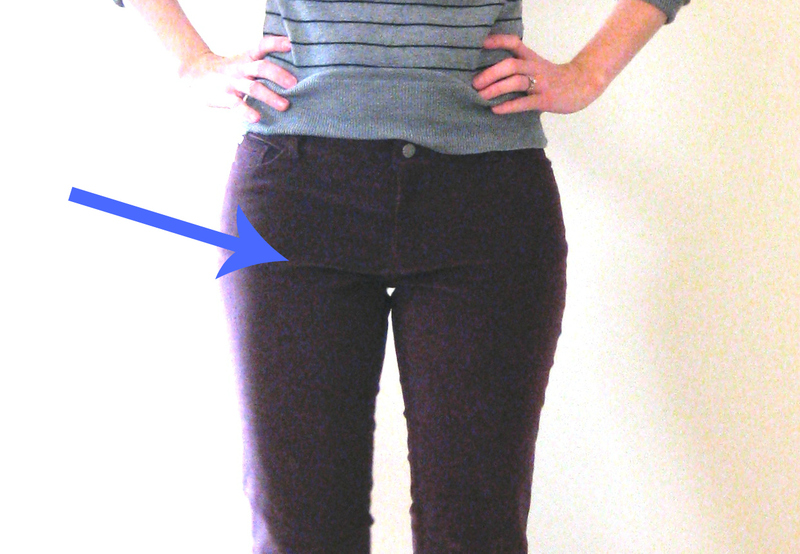 i understand jalie’s idea of keeping some stretch in the waistband, but i just don’t think it will ever keep its shape. obligatory back shot… pear much? 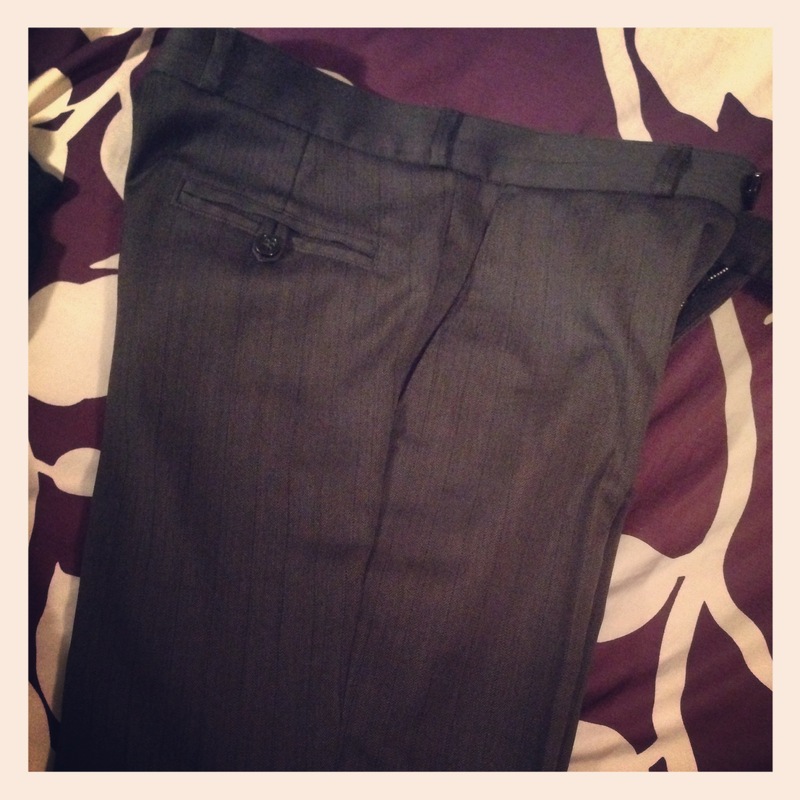 as far as sizing, i cut the size corresponding to my hip measurement. my waist falls about 1-2 sizes down, so during fitting i took 3/4″ out of the CB, and another 3/8-1/2″ total from the side seams. the rule of thumb is choose a size based on your toughest to fit area (hip/thigh) and make simple adjustments to the rest. realistically i think i have a handle on what i need to do next, and i’m very optimistic! for further authenticity, i ordered some rivets and tack buttons (from taylortailor.com). 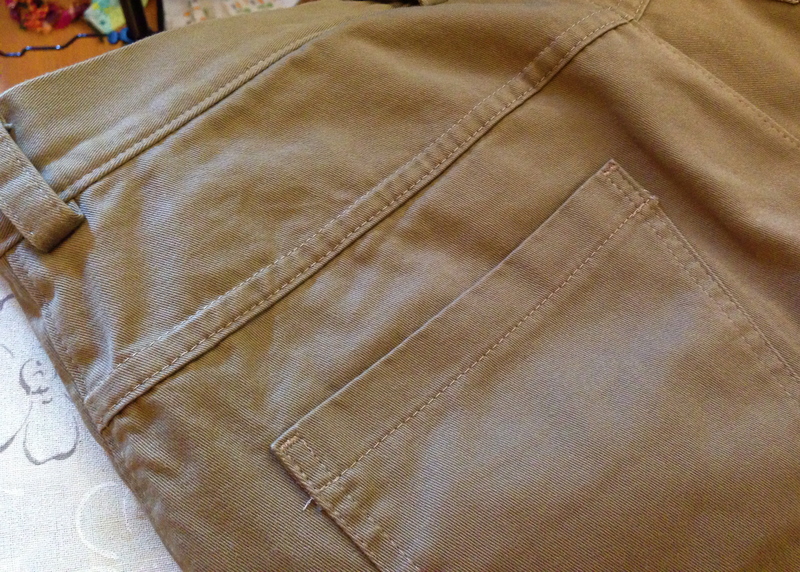 i put one rivet in on the coin pocket to see how it worked and it was kind of a hassle. i think i’ll have to pull out the drill to get a good clean hole for the rivet post. on a completely different topic, i want to introduce my baby sister, Monica to you guys! she shares my sewing obsession and we constantly talk sewing and consult each other when we need opinions. she’s been sewing for several years and just started up her own blog called seams right to me. 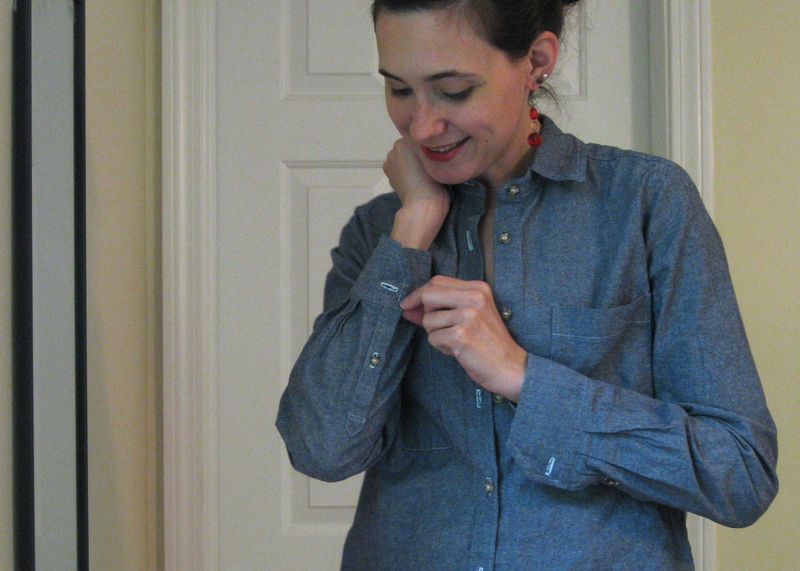 her first garment post is an archer button up, so obviously she has great taste. if you feel inclined to add another blog to your reader, go show her some love! so i’m a little behind in my year end post… i blame this horrid cold/cough/sinus infection i’ve been battling for the past… forever. christmas day saw me curled up on the couch with Nathan cooking me christmas dinner. hey, it’s not a holiday around here unless i’m sick! sigh… i’m finally getting better (yay!) however, most of the sewing i wanted to squeeze in while Oliver had his siblings home to entertain him just hasn’t happened. grrrrrr! sewing-wise, 2013 was a pretty good year for me. i made a concerted effort to sew everyday wearable pieces and my efforts paid off tremendously. i worried that blogging about these non-flashy, non-excitement inducing pieces would be a complete snooze fest to the average reader. however, i have been pleasantly surprised to discover that a whole bunch of readers not only share my interests, but also let me know that they find it inspiring. i had no idea this would be the case. in fact, my readership grew at a faster pace than ever, so i guess finding my niche was a good thing. warm fuzzies for all! 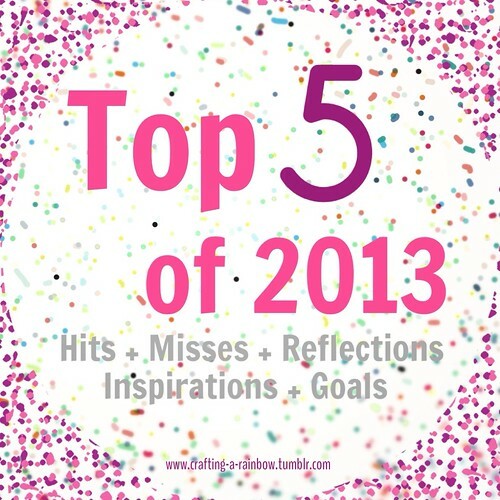 i’m just going to do my top 5 hits… so hard to narrow down, but here goes! 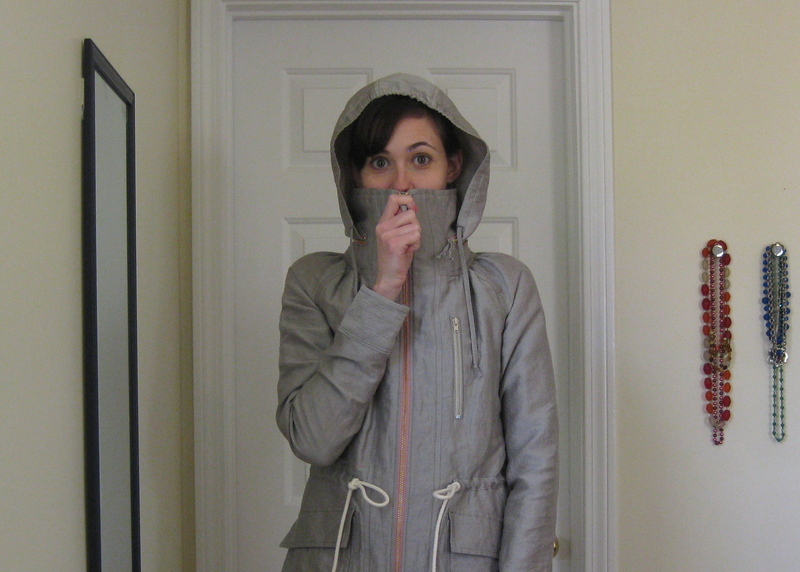 minoru jacket—i love this jacket so much… so much that i want to make another in a darker color so i can wear it with everything! 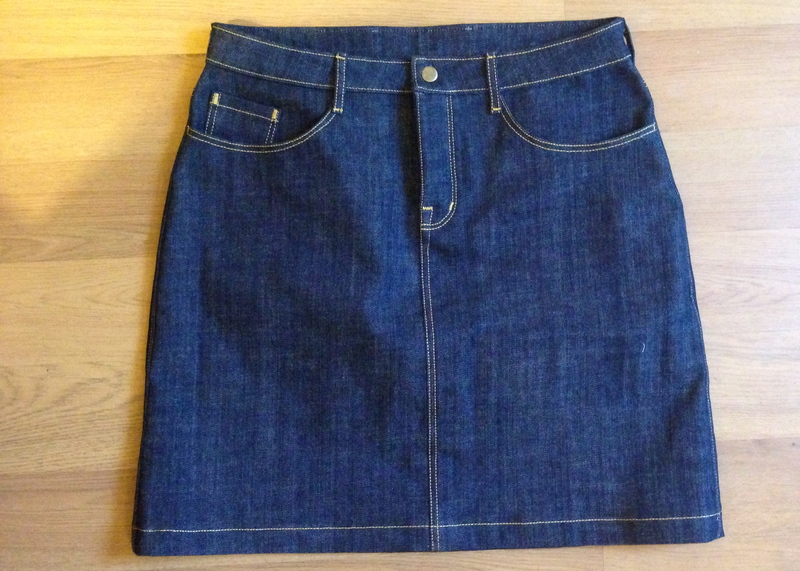 moss mini denim skirt—the moss skirt is a great basic to have in my wardrobe. i’ve used this pattern four times and it is so versatile. 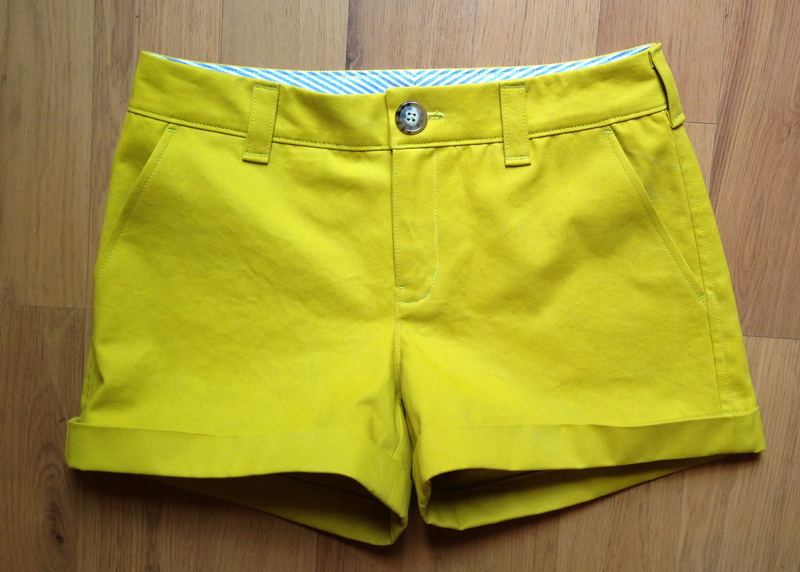 chartreuse thurlows—you all know my love affair with the thurlow pattern, and these shorts are by far my favorite and the most worn. i had no idea they would go with so much in my closet, but they do! chambray archer—i don’t know how i ever got dressed without this archer. chambray is so awesome! i frequently wear it with my poorly fitting leggings (mmmm so need to make more leggings with a better pattern…), and it always looks great with my patterned skirts, or even tied at the waist over dresses… basically i super love this shirt. silk blouses—okay, i’m cheating here, but i made these tops at almost the same time, and i love them both. they are comfy, dressy, casual, and generally awesome. must have more! hemlock tee—this is probably my most reached for knit top these days. it’s drapey, it has long-but-i-can-still-wash-dishes sleeves, stripes, and so on. i needs to have moar. which gives me a grand total of 77 sewn items. i’d say that’s a pretty good year. the unblogged things almost always end up on instagram and include a few kid tees, kid pj pants, and the like. i really love instagram for those in-progress shots, unexciting FO’s, and just daily life. in case my blog mis-represents me, i think that gives a better sense of my life. i’ve read enough “i’m really not perfect, i just make it look that way” blog posts to make me think that readers appreciate a real look into life. in that vain vein, i also joined up on twitter. oh hell, i swore i never would, but i finally caved. i’m still working out what my name should be, but as it stands i’m using @lisagnotes. i haven’t set up my page, it’s just a big ‘ol blank, but i’m sure i’ll be addicted in no time! thanks so much for reading my little corner of teh interwebs, and happy (belated) 2014 to all! i just started working on colette pattern’s new zinnia skirt. i made sure to snag the .pdf when it was on sale and didn’t really plan to make it up quite yet, but the sewing gods have spoken and into my grubby mitts landed a sweet granny floral print rayon. it has those perfect fall colors and i keep saying i need more skirts. it’s a good thing i had mentally noted the fabric requirements, because this skirt takes a lot of fabric! 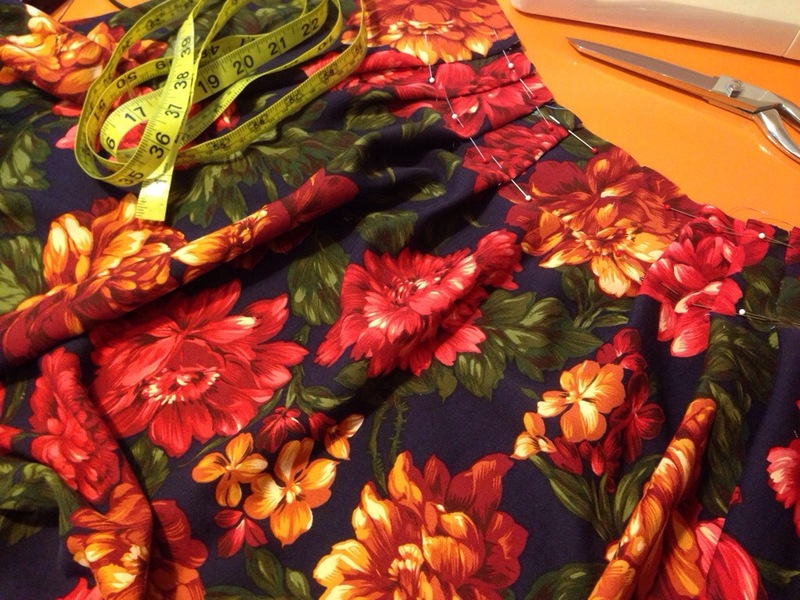 i wouldn’t have thought the skirt needed more than a yard and a half but, this skirt is cut on the crossgrain (directional prints need not apply) and the hem is a whopping 84″-97″ depending on what size you cut. i had 2.5 yds of 45″ rayon and that was just enough. typically i find colette’s yardage totally out of whack, but this one is spot on. 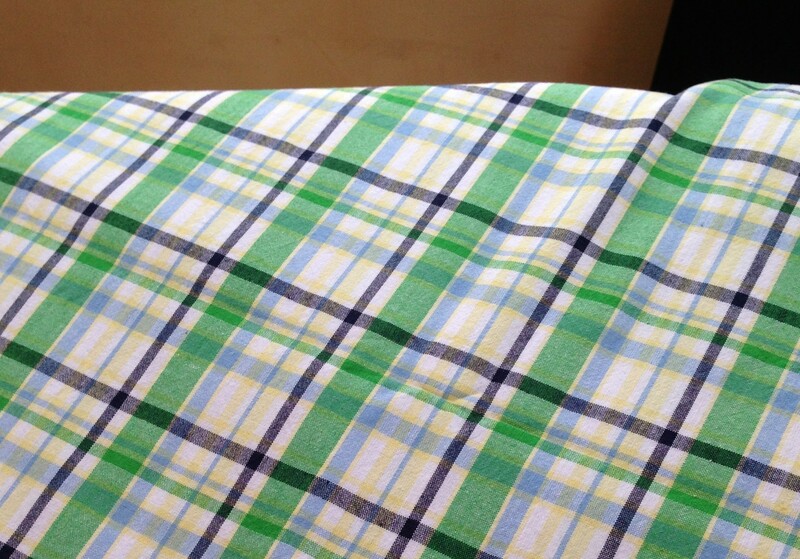 of course, if you want to do any print matching—buy extra! for mine, there was no worry and i didn’t bother with matching on the CB seam. hopefully it won’t matter. since this pattern includes instructions for a lined/sheer overlay version i was curious to see the directions for this, and i’m afraid i was a bit dissappointed. in fact, there’s a tiny detail in the directions that just doesn’t jive. you construct the main pieces of the skirt (pleats stitched through both sheer and lining layer) then you insert the invisible zip through both layers and sew up the back seam, again through both layers. 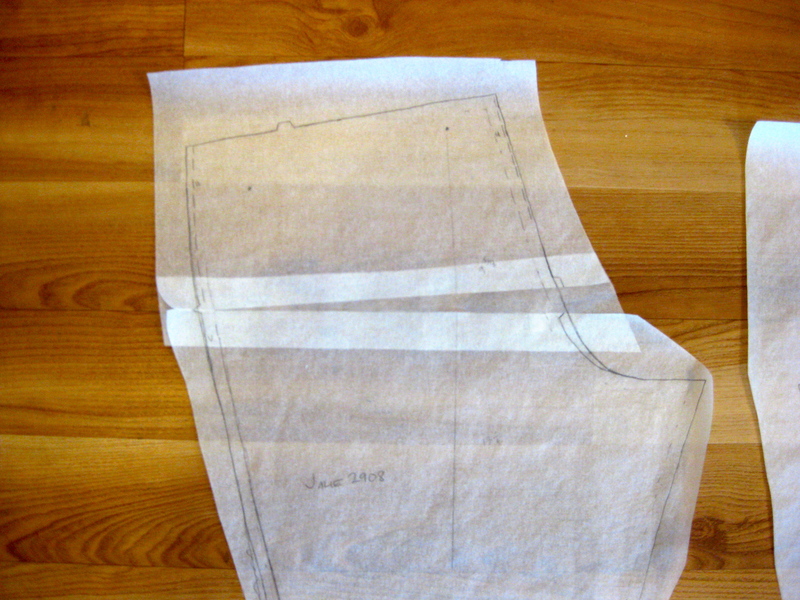 later you are instructed to hem the shell, then trim the lining by 1″ then hem the lining. but… how? if they are both attached down the CB seam? this is not at all how i would approach this. * jen over at grainline has a nifty tutorial where you finish the overlay opening and simply insert the zip into the lining only. 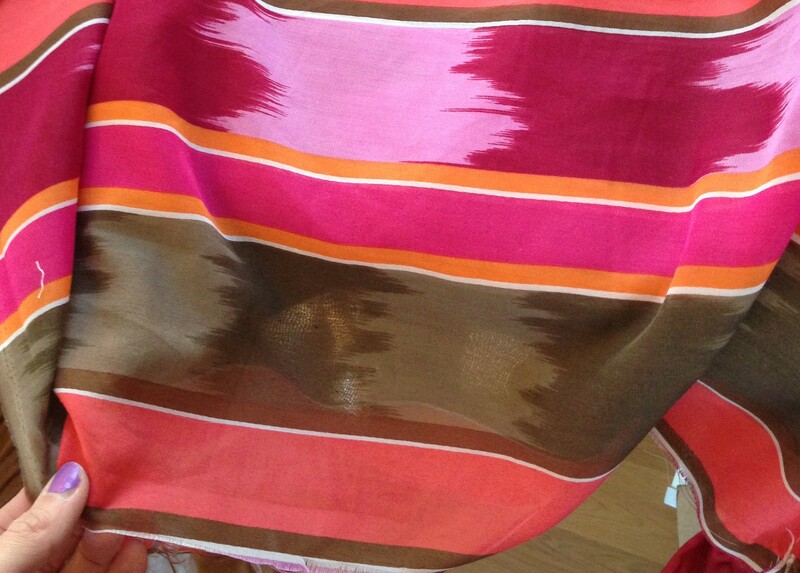 the overlay hangs free, then the seams are sewn and finished separately. now, after i bought the pattern, i happened across the discussion thread on pattern review (whose site is down at the moment… will link up later) and this pattern has garnished some criticism for being too simple, and just another dirndl skirt. now, i’m not sure why people were so up in arms, but i just want to clarify for anyone interested—this is not a dirndl skirt. and, if you do the pleated version, all the fullness should be under control around the squishy belly parts that we don’t need to add tonnage of fabric to. with the pleating action, you wind up with a partial circle skirt. same with the gathered version (as in, it has an a-line shape so there is significantly more fullness at the hem than there is at the waist. while the gathered one is nice, and gets top billing on the cover, i think the pleated skirt is really the star of the show and the reason i bothered to buy the pattern. now you can probably find cheaper alternatives, and people kept pointing to tilly’s gathered picnic skirt, which is a rectangle, i.e. same fullness at the waist as there is at the hem, but i do like the ability to be able to print off another copy of the pattern if i really need to make up a different size. that, and i trust the indie pattern sizing so much more than big 4. if i look at the waist measurement on colette, i can feel pretty safe that the size it corresponds to won’t end up having 4″ of ease. if i grab a simplicity pattern, i have to hunt down the pattern pieces and measure the different sizes to see which will give me a reasonable amount of ease. obnoxious. i didn’t start this post in order to pontificate on pattern drafting and who does it better, but each pattern company relies on a specific block that will work for only a small number of people. colette has one block, while sewaholic has another block, and burda, simplicity, vogue, etc has their own block. there is little wrong with the individual blocks—they will fit someone!—but if they don’t correspond to your body type, changes will have to be made. no. big. deal. what i don’t appreciate is the unreasonable amount of ease given by the big 4 (making the size chart irrelevant), which indie pattern companies have handled much differently, and i believe, much better. 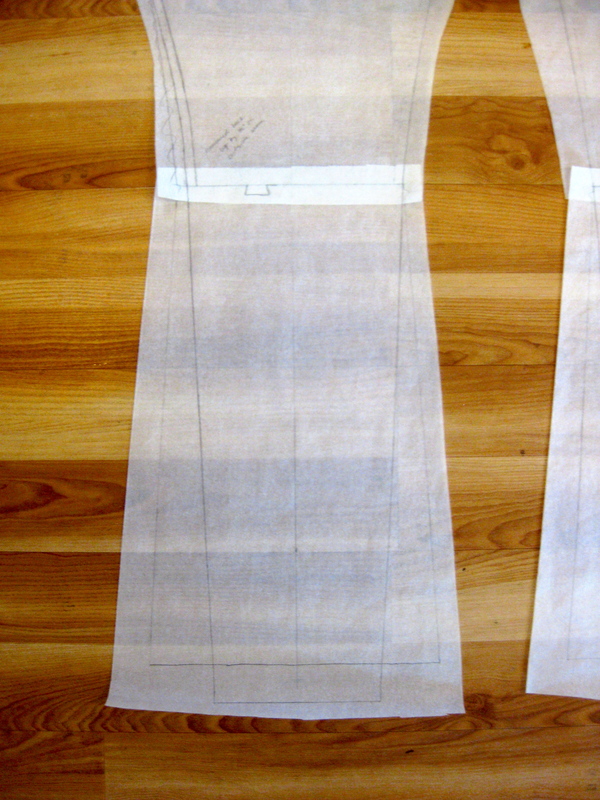 anyways, drafting pleats, while not hard, is tedious and time consumming. i’m trusting that colette patterns did all the engineering for me, and i know there are a lot of people out there who have no interest in drafting such a pattern. so, yeah, you pay for the convenience. in fact, i spent last week working on a very basic dress (with pleats!) and it took all week to get the details right. i could have sewn up the dress in little more than a day, but since i was fiddling with pleats and sleeves etc, it was a bit of a chore! so what do you guys think about the zinnia skirt? love it? hate it? indifferent? do tell! *after writting this up… i see colette patterns addressed this pattern error and future printings will have the correct directions. i still don’t think it’s the best way to go about a sheer overlay, so do with that what you will!